Included Materials: please check that you’ve received all the components needed for the kit in the box. Jingle bells, Jingle bells! 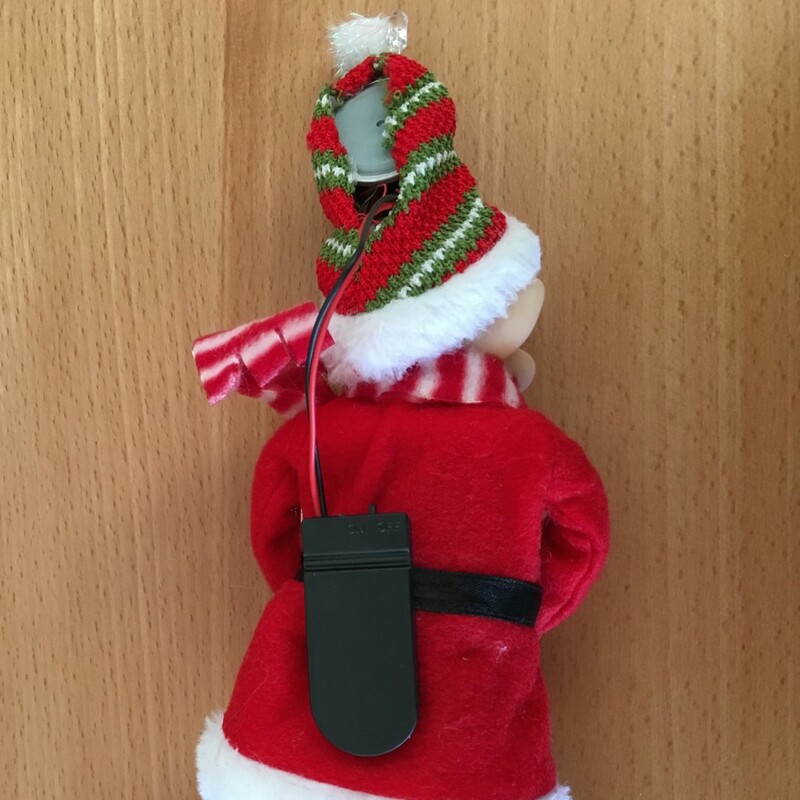 Welcome to world of Internet of Things!Learn to program both software and hardware while making this delightful christmas ornament using the Musical Elf Ornament With LED: Learn 2 Code Kit from KiteCoders™. We will be using open source Arduino hardware and software to build and program this kit. The Arduino computer program along with the hardware components provided in the kit makes the LED light blink in sync with the music written in the software. As a next you can program your own music or extend the music code to add additional lines of Jingle Bells. 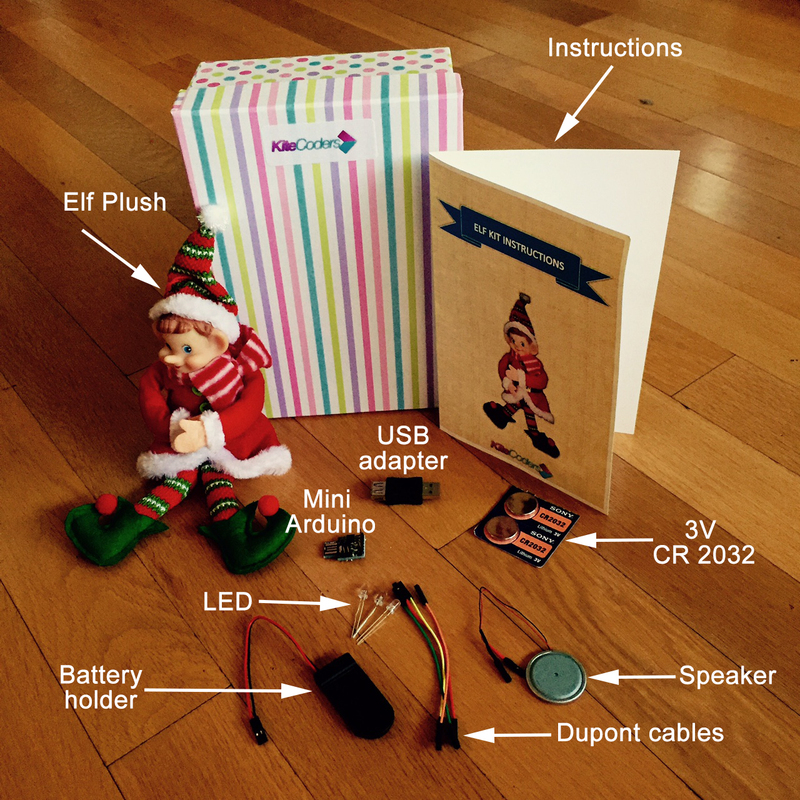 All the instructions needed to assemble the kit and program the ornament are included below with the photographs. Download and read this free Arduino Comic, by Jody Culkin. A very simple introduction to Arduino that will help you out during your first days. Connect the LED to the micro controller. First, connect wires to the Pin 2 and Pin 3 on the micro controller. Next connect, the long lead from the LED to the wire that is connected to Pin 2. Connect the short lead of the LED to the wire that is connected to the Pin 3. Install batteries in the holder. First take the coin cell batteries out of the packaging. Then open the case of the battery holder and insert the two coin cell batteries with the right polarity as indicated. +ve side of the coin cell goes to the +ve side listed in the battery case and vice versa. 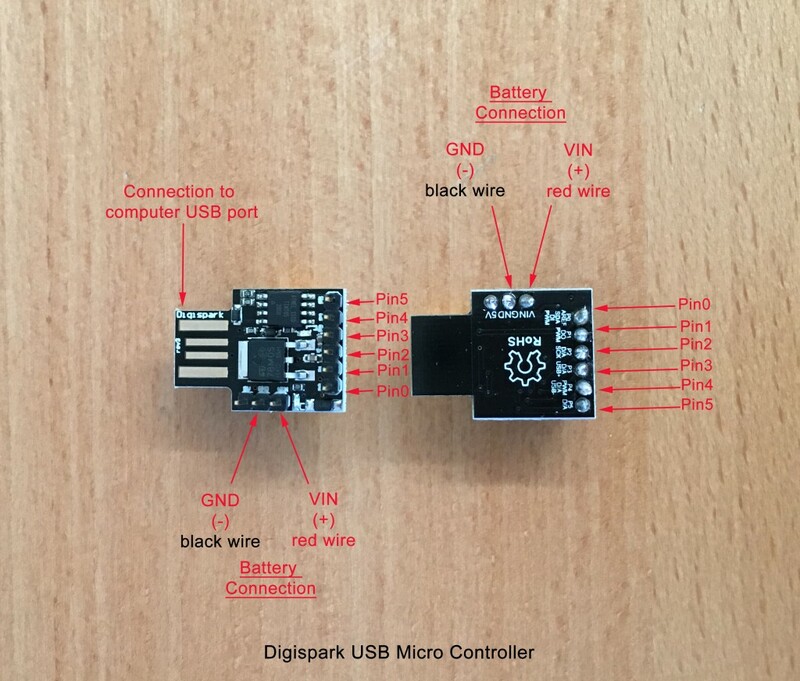 Connect the battery holder to the micro controller. 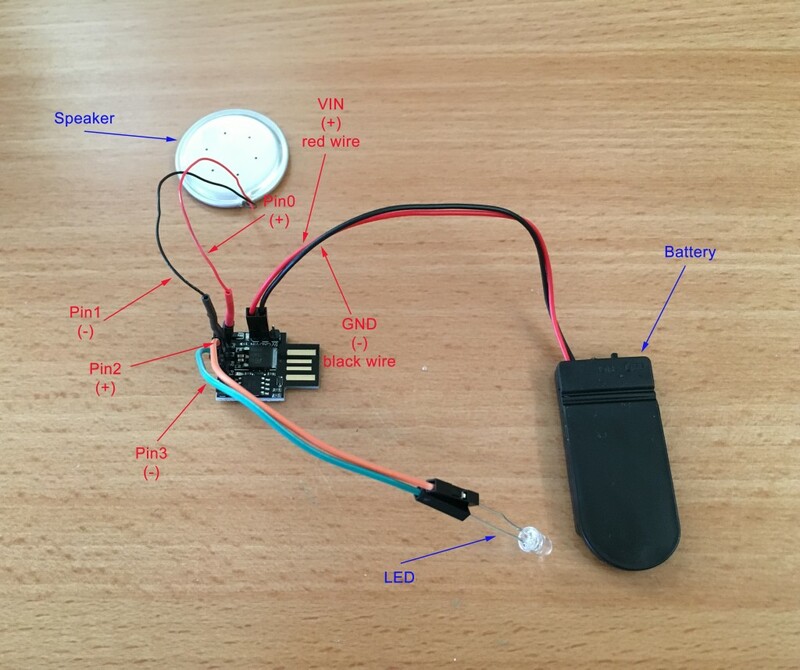 The red wire connection on the battery holder goes to the “VIN” pin and the black wire goes to the “GND” pin on the micro controller. 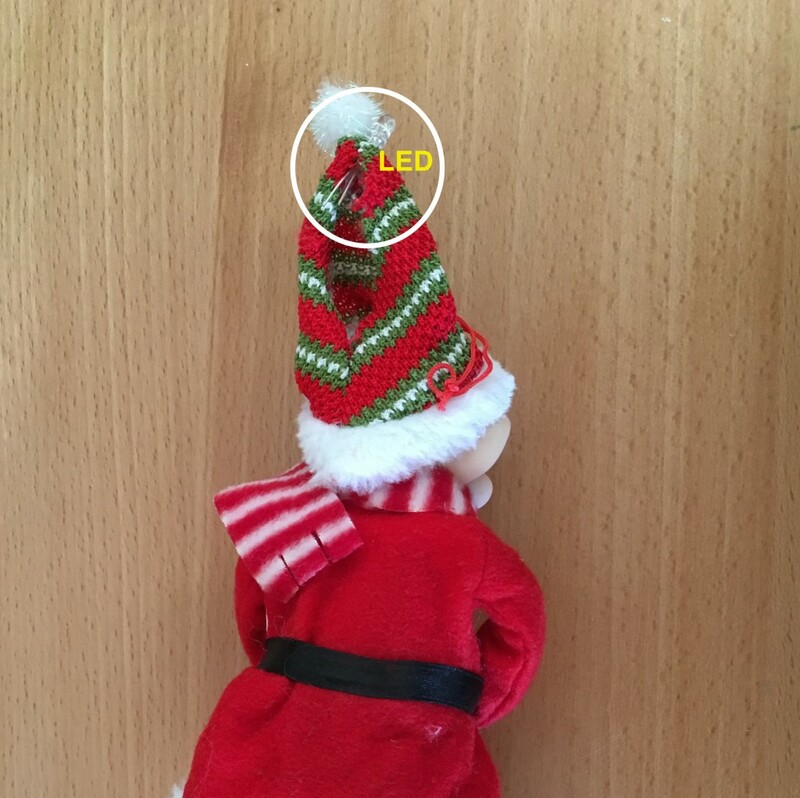 Take out the LED from the assembled hardware and insert it on the top of Elf’s hat as shown on the photo to the left above. Congratulations! Now you can hang the ornament on your Christmas tree. Turn on the kit when you want it. Reference: visit http://kyte.ws/ard-reference for ebooks, video lessons and more. Support: If you run into any issue and cannot resolve it after reading our troubleshooting page then you can email us at support at kitereaders.com for further help.